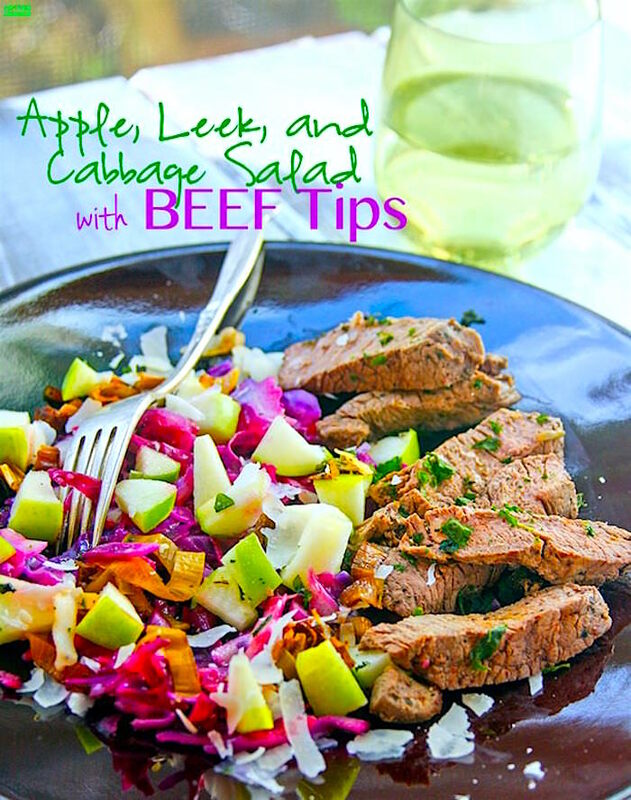 Cabbage slaw with fresh apples and leeks makes a power food pairing with beef tips, or any other lean protein. 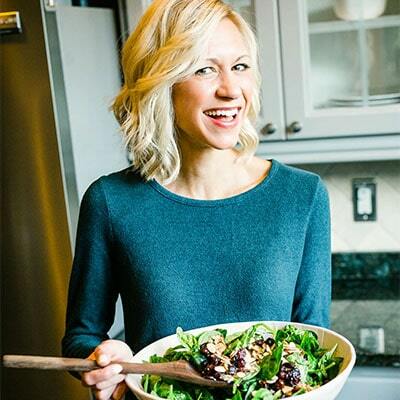 This gluten-free slaw recipe makes a nutrient packed side dish that’s nutritious and delicious! 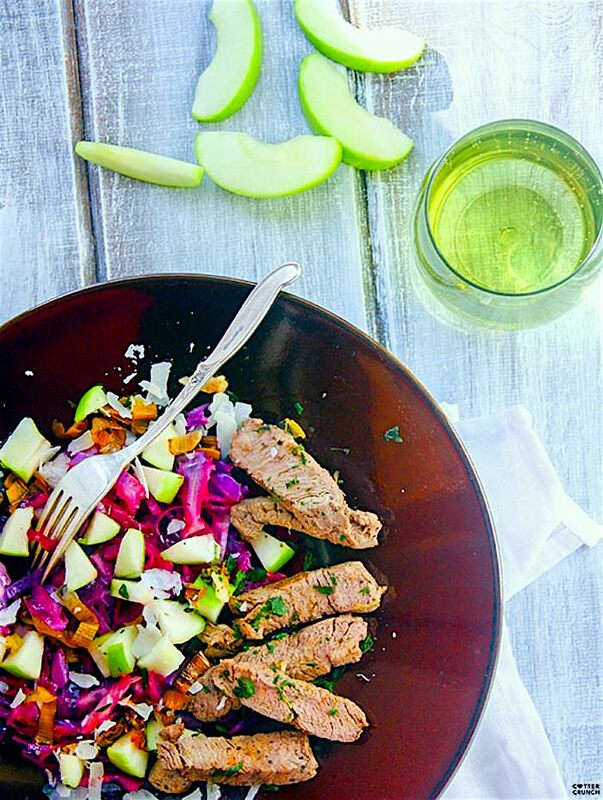 A paleo power salad packed with flavor! Hey there seasonal fresh produce. Hello Spring, and how are ya, warm weather?! Oh man, it feels good outside, doesn’t it? Except for maybe Chicago, I think they didn’t get the memo. But really, are you feeling refreshed yet? Renewed? Or are you still transitioning into Spring? Sorry for the questions, just know I can relate to ALL! We are yearning for a sense of renewal, still in transition from NZ, but know a time will come when we feel refreshed. That’s what this season is about, SPRINGING into new things, new patterns, new healthy intentions. Heck, we can even catch some VITAMIN D rays by dining al fresco, right? Green apples, leeks, and red cabbage are all part of March and April fresh produce, hence this red cabbage slaw recipe. But I’ll get to that in a second. When you eat fruit and vegetables in season, you’re likely get more nutrients due to the quality of the soil content. 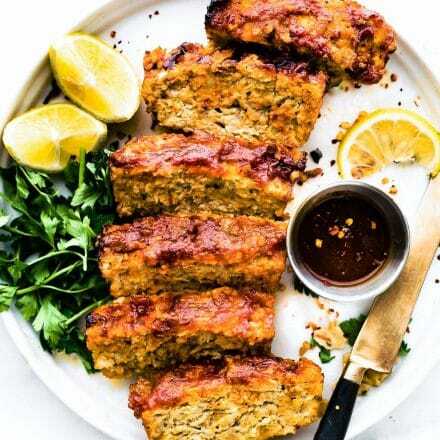 And if you’re like us, you’re needing to BOOST your iron intake after a hard few weeks of training and “transitioning.” The best way to do that is with FOOD! 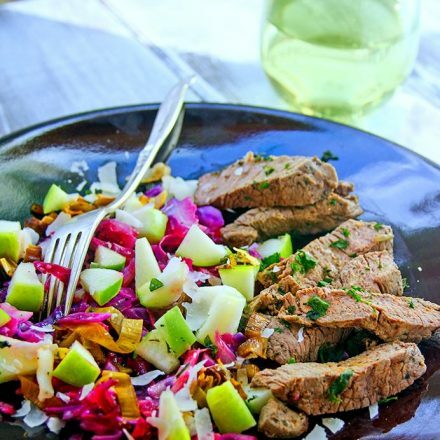 This red cabbage slaw salad recipe can help you digest your food! Plant based forms of vitamin C can help you digest and absorb more plant based forms of iron (non heme). How? Well, when both are digested together, vitamin C kinda clings to the non heme (plant based) iron to create a compound that’s more easily absorbed. 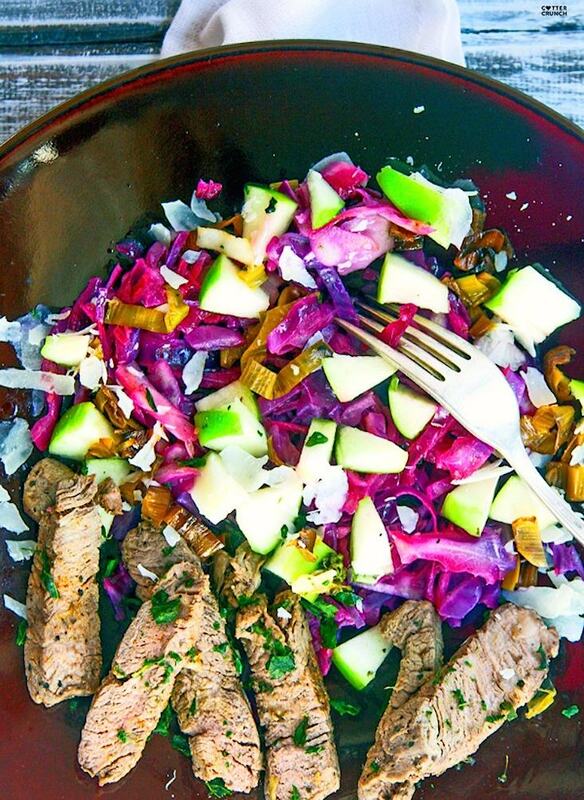 So this red cabbage slaw salad… it’s LOADED. 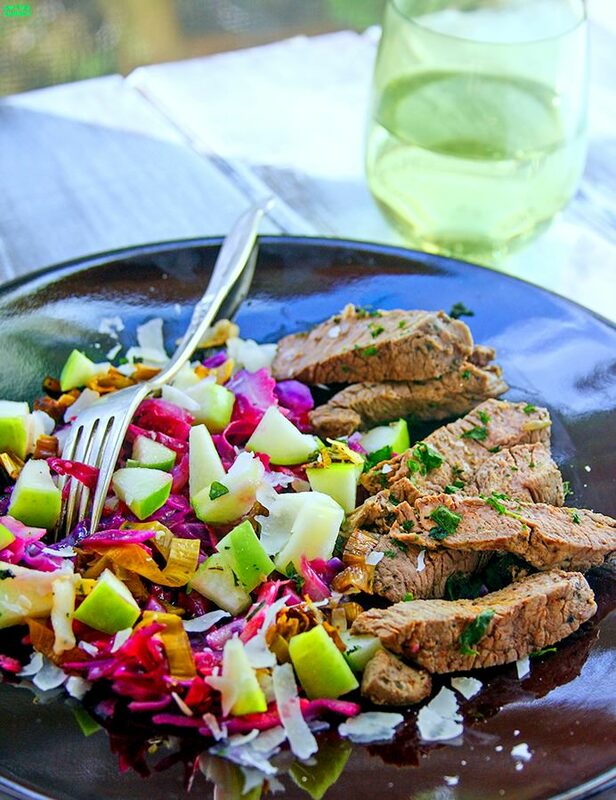 Do you need another reason to make this red cabbage slaw recipe? It’s delicious! Chop all vegetables and fruit and transfer to a large bowl. Add the oil and toss again. I lightly sautéed them in a skillet for a few minutes until leeks were cooked and tender. Once cooked, transfer into bowl and add in vinegars, seasoning, and seeds. 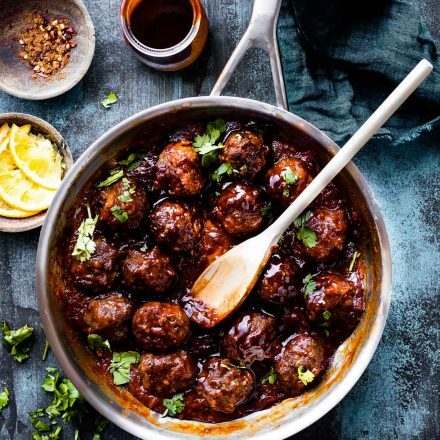 Top with Parmesan or feta and serve with beef tips! If you’d like to know how to cook the beef, simply cut your beef into small strips, season with a dash of black pepper and sea salt, then grill or sear for about 10 minutes or until medium. Then sprinkle a little fresh or dried basil on top when almost cooked. That is optional. Note –> if you are vegan, you can replace the beef with Tempeh. It contains a good source of non heme iron. Now we’re talking! 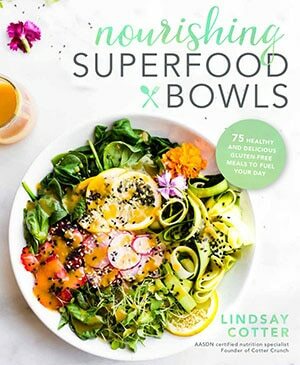 New ways to eat real food to SPRING into good health. Yes, I’m corny and I’m a nutrition nerd, just go with it. What seasonal produce are you eating this Spring? I love adding fresh fruit to salads for a bit of crunch and added sweetness. how is it that you can make beef sound appealing to me?? I want to eat everything you make! This would have been so good with corned beef for ST Paddy’s! Talk about seasonal! I love the combo of leeks and apples–I do a baked chicken dish with both and its so yummy. We’re not quite to dining al fresco season around here, although I did sneak out onto the deck on one sunny afternoon last week. I could live outside, honestly, so it can’t get here soon enough! oh that would be good with chicken! i need to try that next. Stay warm! Oooops I commented on the wrong section! 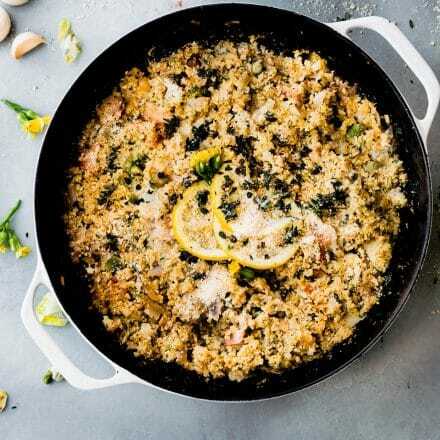 Here’s what I think: This recipe has everything I love about “power” foods! I’ve been making more salads with cabbage lately. And beef… girl that’s my protein! <3! you commented in the right spot, there are two sections for this post. haha. But thanks for posting in both, you rock! and BEEF FOR THE WIN! YAY! So delish! Is that wine you served it with?? 😉 I cannot wait to try this recipe…it would even be Whole30 compliant for me if I didn’t add the cheese or syrup. Oh yeah! yum!!! I’m all in for anything with beef tips, but this looks especially delicious! you and me both Livi! Edmonton didn’t get the memo either — we got snowed on! And I’m loving the combination of leeks and apples. We use that in a veggie egg salad that we make every Easter, and I can’t wait to dig into it this year! ohhh will you share the recipe? sounds amazing! So delicious! I’ve been avoiding apples but this is making me crave them in a salad! i was too, but when added to a salad like this, the fructose can be handled/digested a little better. Thank goodness! It’s the cabbage, it helps. Seriously, where is SPRING? I went to the farmers market over the weekend expecting to see all those lovely spring veggies but there were potatoes, potatoes and some squash. Can’t wait until is as bright as sunny here as your salad looks! hawaii can’t get here soon enough for you, right?sigh.. stay warm! love frozen veggies too! so handy and easy to make! agreed! I love leeks, but never think to eat them in a salad!! That certainly has to change. I’m pretty obsessed with red cabbage and try to add it to everything!! This salad sounds so yummy with the sunflower seeds!! have you tried them sauteed first? so good! This looks good and I actually have some cabbage that I need to use!!! that slaw looks so good! I’m totally making this as soon as we make another grocery trip. I love cabbage in a big way. Wow this looks awesome Lindsay! Totally David and I’s kind of meal! always on the look out for more cabbage recipes, it’s one underrated veggie! you read my mind! cheers! 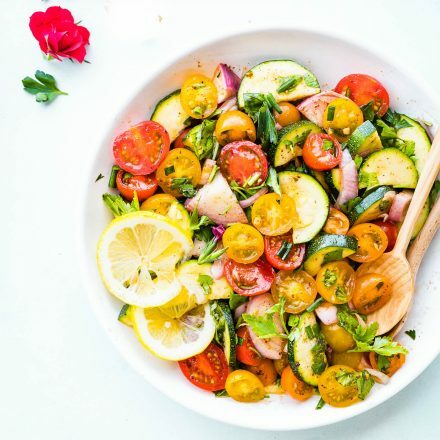 I love this salad for its seasonality, the colors and bold flavors. I cannot wait to get farm share produce. It’s still a bit too cold here to dine al fresco but a girl can dream….or at least I can. maybe you need to come visit then! warm here! I’ll be happy too! and i’ll make fish instead of beef for you! I’d like to spring into your kitchen please. This looks delicious! Jump on over! bring those hot cross buns. LOL!